There’s an art and a science to setting up a finite element analysis for solidification modelling. While there are a number of foundries that already use products like SOLIDcast and FLOWcast from Finite Solutions, not everyone is ready to tackle the task. We’ve talked to a few foundries that don’t have the right expertise in house, and are not quite ready to get started using this powerful computational tool. One path is to grab a new hire from one of the FEF schools. Odds are, they’ve had a class or two on flow simulation. We’ve seen stellar work out of the new grads from places like VA Tech or UNI. If your foundry is taking the long view, this investment will pay off in spades, and allow you to bring in a whole slew of new technology to improve your operation. Another option would be to bring a training seminar in house. The seminar can also help you refresh talent that you still have, or give you a chance to satisfy someone’s need for professional development, and increase your foundry’s capabilities all at once. Training can be tailored, so that you can get more out of the modules like FLOWcast or OPTIcast. A great opportunity to get more out of the tools you’re already paying for! Finally, you might not be ready, or be willing to bring on that new hire just yet. Finite Solutions, or some of their customers can provide an outsourced engineering function. 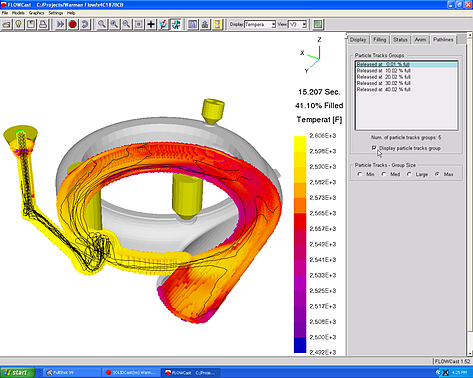 They can start with you (or your customers) CAD and design the simulation for you. In this case, you can access the cost savings of the simulation tool, without committing to the full license fee. This is a great way to test the waters, off load a little bit of the work on your staff engineers, or maybe just get help with a particularly gnarly problem. It also will allow you to develop a better understanding of the benefits, and let you wait to invest in the new hire or training until your volume starts to increase. Whichever path you choose, don’t ignore the benefits that using simulation tools like SOLIDcast, FLOWcast, and OPTIcast can provide to your foundry. For more information on Finite Solutions simulation software products you can go to their website, Finite Solutions or call your local rep.